In the episode’s climax, the Doctor is shot by a Dalek and begins to regenerate. 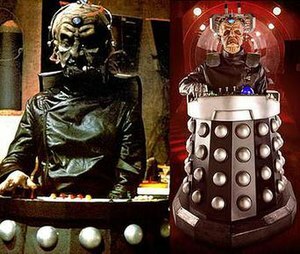 The episode marks the first appearance of Davros since the 1988 serial Remembrance of the Daleks; he is portrayed by Julian Bleach. It is also the firstDoctor Who appearance of Eve Myles as Gwen Cooper; Gareth David-Lloyd as Ianto Jones; Tommy Knight as Luke Smith; and Alexander Armstrong as the voice of Mr Smith. Adjoa Andoh and Penelope Wilton reprise supporting roles as Martha’s mother Francine Jones and former Prime Minister Harriet Jones, Paul O’Grady and Richard Dawkins make cameo appearances as themselves as television personalities who attempt to assuage public fear. 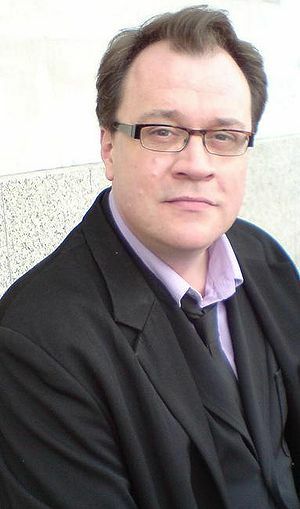 The two-part finale’s epic scale and underlying plot was first conceived in early 2007 as the last regular-series story for departing producers Russell T Davies, Julie Gardner, and Phil Collinson: the fourth series finale is the last story produced by Collinson; and Steven Moffat and Piers Wenger replaced Davies and Gardner as show runner and executive producer in 2010. Major concepts were already specified by July 2007 and the script was written in December 2007; Davies began on the 7th and finished on the 31st. Filming for the finale took place in February and March 2008, and post-production finished in mid-June 2008, only two weeks before the episode aired. To conceal as many plot elements as possible, “The Stolen Earth“‘s title was not disclosed until sixteen days before broadcast, preview DVDs omitted the scene where the Doctor regenerates—the last scene is the Doctor being shot by a Dalek—and the episode aired without a preview trailer for “Journey’s End”. The episode was reviewed positively by both the audience and professional reviewers. The Audience Appreciation Index score was 91: an unprecedented figure for Doctor Who and one of the highest ratings ever given to a television programme. On its original broadcast, it was viewed by 8.78 million viewers and was the second most-watched programme of the week; when of broadcast, it was the highest position Doctor Who had ever reached. Critical reaction was overwhelmingly positive: Nicholas Briggs and Julian Bleach were commended for their portrayal of Dalek Caan and Davros respectively; and most aspects of Davies’ writing were applauded: most notably, the twist ending of the episode was universally appreciated. The shock regeneration created an unprecedented level of public interest in the show, which continued until the transmission of “Journey’s End”. The episode was received positively by the audience and professional reviewers. It received one of the highest Audience Appreciation Index ratings for a television programme, and when first shown was the second most-watched programme of the week.